eLearning Trends / Does V/R Have A Role In eLearning Development? The most innovative development in eLearning used to be gamification. Now, it’s Virtual Reality! But is VR ready for its moment in the learning spotlight? And has eLearning matured quickly enough, reaching a large enough swath of the population to warrant an integration with VR and AR? Indeed, the global VR market is still on the rise: a Zion Market Research report puts the global VR market at $26.89 billion by 2022. Ever since Oculus Rift came out and was bought by Facebook, consumers have associated VR with gaming. But, contrary to popular belief, it’s not just for the gaming industry. It’s also popular in educational software. Goldman Sachs reported that educational software incorporating VR and AR is set to bring in $300 million in revenue by 2020, rising to $700 million by 2025. So the big question is not simply whether or not VR has a role in eLearning’s development — because it clearly does. The question is why VR and AR are enhancing eLearning, and how they will be used within the eLearning industry as the two entities mature. Why is the present moment the right time to start integrating VR/AR technology into eLearning? Marketers can answer that one for you: No one is quite there yet, which means eLearning course developers are relatively free to test new strategies and see what learners respond to, where the opportunities lie and how the technology can be improved on. Digital learning is, by nature, a medium that requires connection and immersion. When MOOCs were first created, they were intended to provide a ‘constructivist’ perspective of highly connected, ‘nodal’ learning. In other words, students took learning into their own hands, forming diverse networks of connection between each other as peers. Rather than a top-down model of instructor-led lectures, digital learning relies on shared and open-source information across a vast network. And VR/AR technologies take that nodal learning one step further, catapulting them to a truly immersive experience. This allows eLearning to go further, offering students hands-on learning opportunities, simulations, and trial-runs that might not otherwise have been possible. Tactile or kinaesthetic learners, for example, can truly benefit from this addition. Which leads to the next aspect of digital learning: engagement. ‘Engagement’ is a big deal for companies who invest in digital learning and e-courses as a way to both retain their top talent, making them more competitive, as well as engage them through these L&D (Learning and Development) initiatives. So how exactly does VR fit into the broader eLearning landscape? And how can course developers begin to use VR/AR technologies to give students a leg up, making sure they gain tangible value from their digital experiences? In other words, where do we go from here? While product demos aren’t necessarily relevant in the world of MOOCs, consider how useful it would be to be able to have an engineering student take apart and explore the components of a machine. Or what it would mean for an emergency first-responder in training, who is doing distance education, to be able to perform procedures in virtual reality. ‘Demos’ or demonstrations can help bring a lesson or a crucial learning objective to life, actually imbuing the student with real and memorable practice. Alternatively, VR environments can also be used as a form of assessment. 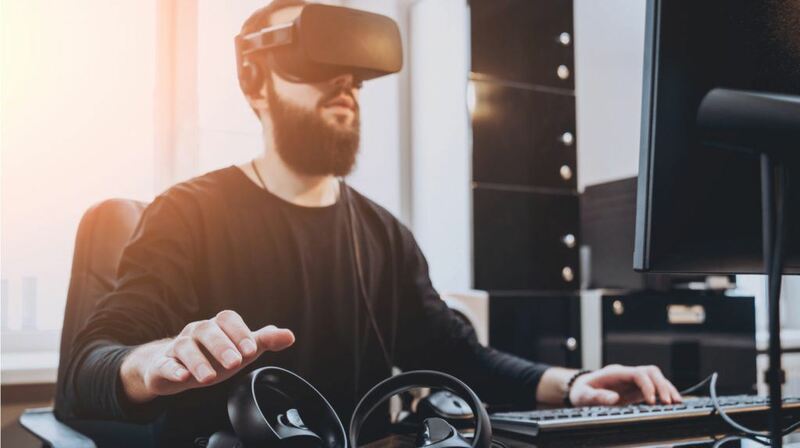 To help reduce the time it takes to get individuals comfortable with online training tools, VR/AR technologies and the environments that come with them can help learners become comfortable faster. This is especially useful for employees who are taking online training, since these individuals are working on projects simultaneously and don’t have extra time to spare. Students learn a great deal from activities that enhance learning such as pair-programming (usually done with some kind of screen share software, if being done remotely) or through watching an ‘over-the-shoulder’ walkthrough. But VR/AR technology integrated into eLearning allows learners to engage with these walkthroughs, within interactive and hands-on environments. These ‘simulations’ do more than simply invite a learner’s attention. Instead, they nurture and necessitate interaction, making the walkthroughs far more effective, memorable and personal. VR and AR technologies have a bright future in eLearning. But it does come with a caveat: We’ll need to see hardware reach the hands and behaviours of consumers. In this, it’s not only cost that can be prohibitive – it’s also a question of size and convenience. For example, the purchase of an Oculus headset is something users found tedious or even extraneous if they weren’t already gamers. Consumers who don’t show a proclivity for gaming, may prefer if their mobile devices – the hardware they already use – could be adapted for VR/AR. It’s these modifications and adaptations that will make consumers more likely to adopt VR into their everyday digital experience. Once this happens, we’ll see a real maturity of VR/AR technologies in eLearning. In the meantime, the fact that global investments in VR technology increased to $3 billion in 2017 will have to be a good enough indicator for the future promise of its evolution and eventual integration.